But all of this is to say, since I am always on the look out for Austen rewrites that address characters beyond just Lizzie & Darcy, I've been finding myself especially curious to see what writers would do with Lydia's story, and whether she can be made sympathetic and still retain her Lydia-ness — so of course, I was very happy to learn that the second book in Maria Grace's Queen of Rosings Park series was tackling "the Lydia problem"! And for the most part, I think it does so quite well. Now, before I get into all of the pros and cons and whys, I need to make clear that the Queen of Rosings Park series takes a very different approach to the canon of Pride & Prejudice, shaking pretty much everything up and creating a whole new (and rather unpleasant) upbringing for the Bennet sisters. This means that the Lydia we know from P&P is already on quite a different path than what we're used to. I mean, she's still Lydia, and she still does the traditional thoughtless-Lydia things. But her life and the events that have formed her are just not the same, and that really comes into play in this story, in how her transformation comes about. But though her life and experiences are so different, and her internalized feelings maybe more extreme as a result, I found them to be a pretty fascinating and potentially accurate reflection of who she is or could be. The idea of Lydia as a creative, who loves to draw and paint and seems to have almost an inexplicably exceptional natural talent for it, at first seemed a little off to me. I couldn't picture Lydia applying herself to something, and I wasn't sure if she really had that spark of creativity and intelligence needed to be the talented artist that she appeared to be. But then — silly as it is — I recalled the scene with the bonnet, the very ugly bonnet, that she might as well buy as not; she had plans, you see, to pick it to pieces and rework it. On first reading, this seems like another bit of frivolity on her part -- shallow, heedless, bad with money, idle hands and devils work and all that. But actually it speaks to a a self-assuredness that she can remake it into something more, and a desire for creativity and occupation -- albeit not one she finds boring. Add in the fact that the Bennet girls never had masters to teach them such things, or seek out the seeds of such a talent, and it becomes a little less far-fetched that those seeds could be inside Lydia, just waiting to burst forth. 1) There came a point where the male lead made my skin crawl a little bit, and I was almost really put off by him, and their relationship. BUT I came to realize that this is just as much a story of redemption for him as it is for her, and if I can forgive her some things, I can forgive him, too, so long as he's demonstrated a willingness to be better (and he has. He certainly has). and 2) It definitely needs a little more Lydia feel. I make allowances for the fact that this is, as mentioned, a totally new interpretation of her (and all of the characters), and so, because her life has been so different, she's obviously not going to behave quite as Austen's Lydia would. Bus she starts out a bit too demure and tractable, and she learns and grows too easily. I can't help but feel Lydia would dig in her heels more, and she's certainly not an easy character to make feel shame (as evidenced by her wedding and reaction in the original text -- she was essentially ruined, and still found it all a lark). Even in her manner of speech, she feels a bit too mature and buttoned up, right from the start, for me. I need a few more "Oh, la! "s and general noisy exclamations. This Lydia is no wallflower, certainly, but she's lacking that characteristic boisterousness that makes Lydia Lydia. And frankly, I want to see a Lydia that can be "reformed" and have a Happy Ever After while not being totally dampened or losing her spark. 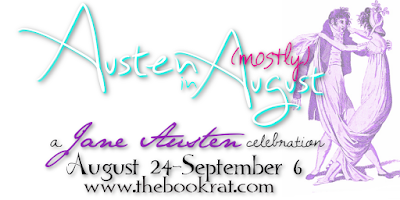 But again, Grace has a juggling act of being both true to Austen and to the quite altered retelling that she's set out to tell, and I do make allowances for that. All told, this is another strong book in a fascinating series, and though it may be too far removed from the original to make it to everyone's liking, I think it is an excellent example of what a classic-inspired retelling or continuation can be. 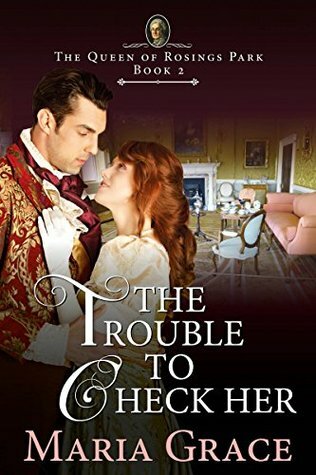 Definitely recommended for fans of the series, JAFF, and those curious about Lydia (as well as those who just plain like historical romance that falls on the more wholesome, rather than steamy, side). If you're reading it for the Austen: definitely read book 1 first; you'll really need that world-building. If reading it for the histrom, you could probably jump right in, without knowing more than the basics of P&P, and still find it completely enjoyable. If you've read this, definitely let me know your thoughts in the comments! And don't forget, Maria has offered up a copy to one of YOU, so make sure to enter to win! It sounds like it really got you to thinking about why Lydia is the way she is beyond the obvious and that's interesting that the author gave the hero some character growth needs, too. I like it when both romance partners are more equally matched instead of one being perfection and the other not. A simply lovely read. In this alternate reality for Jane Austen's characters, Lydia grows into the young lady one feels she was always meant to be.